RasterWeb! 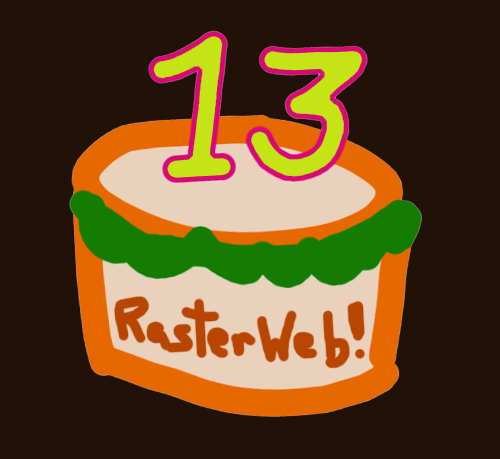 13 Years of RasterWeb! 13 years of blogging… You can browse through the archives if you like. It’s all there. I just keep going. I don’t know why… probably because it’s hard to stop. I don’t give up easily, and I like to keep trying. Things were obviously very different in 1997 when we started. There were a handful of blogs and you could read them all during your lunch hour. As much as I’m saddened to see an old friend abandon their blogs, I’m often quite pleased to see some are still at it. I’m considering a few new taglines, perhaps: “Wisconsin’s longest running blog” or something… I dunno, any suggestions? Anyway, I’m just here to congratulate myself on 13 years of blogging, and hope for another 13 to come… Keep up the good work, self! Posted on Sunday, August 8th, 2010 at 8:56 am. Subscribe to the comments feed. Both comments and pings are currently closed. Post on your own blog. Congratulations Raster! :) I myself am a fan of the tagline “The coolest 13yr old on the block”. Cheers!